Get detailed information and some excerpts of the videos here!
" 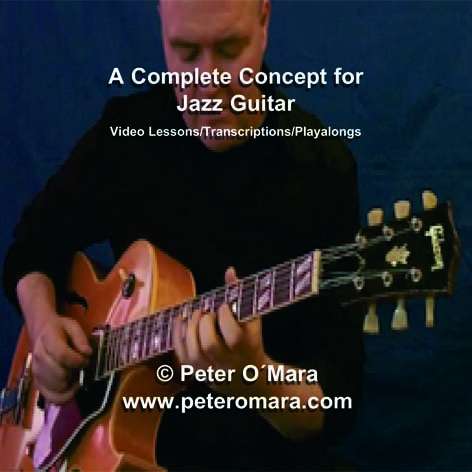 A Complete Concept for Jazz Guitar" is an absolute must for anyone who wants to play jazz guitar! I used to play along with records every afternoon after school, rock mostly but also some blues like BB King, Freddie King, Johnny Winter and Rory Gallagher. It was great to get inspired by these legends. Later when I got interested in jazz guitar my teacher told me about Wes Montogomery, Barney Kessel, Herb Ellis, Kenny Burrell & Joe Pass. I started listening to their records and realised that the musical language was more complex that what I had listened to so far. It was frustrating not to be able to recognise lines like I had with the blues players. It seemed the jazz guitarists were using another language to improvise. My teacher, George Golla, was able to explain to me that those jazz guitarists were playing in a style which was heavily influenced by Bebop, an improvisational language invented in the 1940´s by Charlie Parker, Dizzy Gillespie, Thelonius Monk and others. Bebop incorporates chord extensions and a more complex rhythmic structure than blues, although keeping the essential sound of blues - the pentatonic scale (or blues scale). "How can I incorporate diverse musical influences in jazz to develop my own personal playing style? " I started buying books with transcriptions of jazz soli and was immediately confronted with my poor sight-reading skills. This was really frustrating! Then I realised that I could just play along with the recordings like I used to when I was a teenager. Suddenly everything started making sense! I could hear the lines floating around in my head and gradually was able to find fingerings for them. New horizons opened up through just listening, although I continued having lessons to improve my knowlege of chords, scales & sight-reading. Over the years I was able to perfect my own personal style, learning from the musical opportunities that were offered to me. Although I wasn´t admitted as a student back then, I´ve ended up teaching at two universities as well as dozens of workshops internationally and have had hundreds of successful students. Now I´d like to pass on my knowlege to you! When you improvise over jazz standards you have to learn to be able to play over changes. Improvising over a traditional blues progression uses just one scale which covers the three basic chords: the blues scale or pentatonic scale. Improvising on a jazz standard requires you to play lines that are designed for each chord separately, as well as learning to handle key changes and fast tempos. That makes it much more difficult for you to play on. It can be really frustrating trying to figure out the right scales and developing good melodies from them. Also, there are so many chord shapes it´s hard to choose the ones that sound best for your purpose. This series of videos will help you achieve all that and much, much more! No more struggling with music notation! This concept will show you how to develop your ear and put new sounds into your improvisation.